I confess, I was late to the Fargo party last year, binge watching the entire first season on Blu-ray in a matter of days. I haven’t made the same mistake this season, which is every bit as brilliant as the first and loaded with similarly provocative themes. An anthology series like True Detective or American Horror Story, although much better and more consistent than either, the second season of Fargo is set in the frigid territory of Luverne, Minnesota, and Sioux Falls, South Dakota, in 1979. The story centers on the Gerhardt family syndicate and an encroaching Kansas City mob. When the runt of the family, Rye (Kieran Culkin) tries to prove his value to the family, he triggers a series of events that ripple through a number of families in the area from young Vietnam vet and State Police Officer Lou Solverson (Patrick Wilson) to butcher’s assistant Ed Blomquist (Jesse Plemmons) and his beautician wife, Peggy (Kirsten Dunst). Death abounds in some of the most popular television series at the moment, much to the chagrin of conservative watchdogs like the Parents Television Council, who classified American Horror Story: Hotel as the most vile television series ever created. It’s also ticked off more liberal viewers like Richard Lawson, who bashed the Hotel pilot in his article for Vanity Fair. Far from trying to push the envelope for scandal’s sake, Fargo uses death (and often grisly ones) to ask very deep questions about our relationship to/with it. At church this past weekend, we talked about the sanitation of death and how it’s more distant from our lived experiences than it was only a few decades ago, even though we are inundated with it in 24-hour news cycles and a sea of streaming content. We shuffle our elderly from nursing homes to funeral homes to their permanent home in the grave. Such compartmentalization wasn’t as prevalent only a few decades ago. 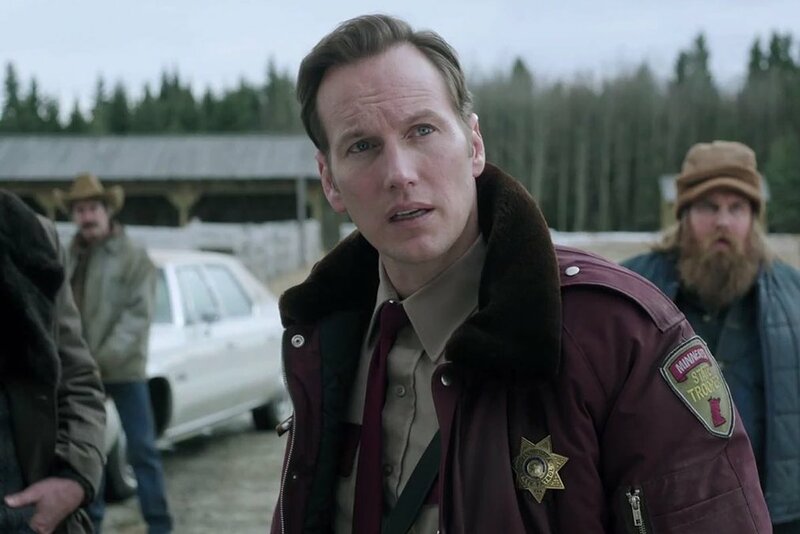 Officer Lou Solverson (Patrick Wilson in one of his best performances to date). So when three dead bodies show up at the Waffle Hut in Luverne, it provides the characters (and us viewers) opportunities to respond. So far, there seem to be three reactions. The first is from Officer Solverson and his father-in-law, Sheriff Hank Larsson (Ted Danson), who investigate the crime scene. Taking in the carnage around them, they sigh, “Yeah.” They take in the death around them with an affirmation of its reality, yet they go home and go about their lives, appreciative of the precious life around them. There’s a profound depth to Lou’s steadiness, his ability to witness the horrific, put himself in harm’s way (in the gripping third episode), and go home and kiss his cancer-stricken wife and read a silly book to his daughter. 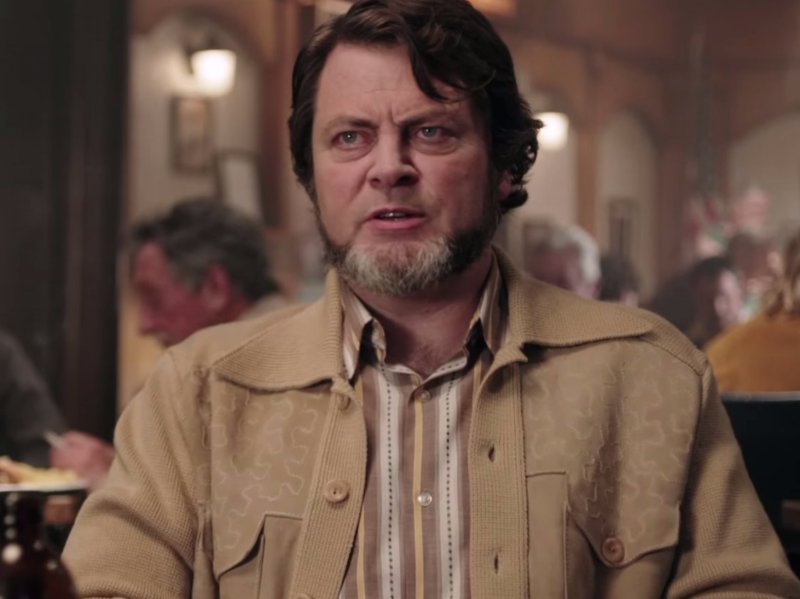 Nick Offerman as the conspiracy-minded Karl Weathers. The second might be found in town lawyer Karl Weathers (Nick Offerman), a smaller character in the first four episodes, who rails against the horrors around him, claiming conspiracies left and right. Illness and death can never simply be a part of life, but rather a gross imposition by some corrupt outside force. Of course, his attitude could change as he gets closer to the death-dealers as Episode 4 seems to suggest he will. The third, and final (for now), approach is found in Ed and Peggy, the latter of whom runs over Rye and takes him home, bloody and bruised. She seems content to leave Rye to lick his wounds in the garage until Ed finds him and is forced to kill him when Rye attacks. Faced with a broken windshield and a corpse, Peggy’s advice to Ed is that they simply “clean it up.” This is, perhaps, the most dangerous of the three approaches and characteristic of our own relationship to suffering and death around us. We clean it up quickly with the shallow hope that wiping it away will make everything fine. Kirsten Dunst as Peggy and Jesse Plemmons as Ed Blomquist cleaning it all up. Like the first season, this second season also deals with the ambiguity of life and our desires and efforts to find meaning in the midst of it. In the pilot episode, a judge recounts the story of Job to Rye as he threatens her: “If Satan couldn’t change Job’s mind, what makes you think you’ll change mine.” Episode 3 is entitled “The Myth of Sisyphus,” which could serve as a subtitle for the entirety of the second season. All the characters are trying to find their place in a new world. Floyd Gerhardt (Jean Smart…where has she been all this time?!) tries to find a place for her family’s business in a world that is becoming more corporate. Peggy wants to attend a seminar where she can learn to be her best self. 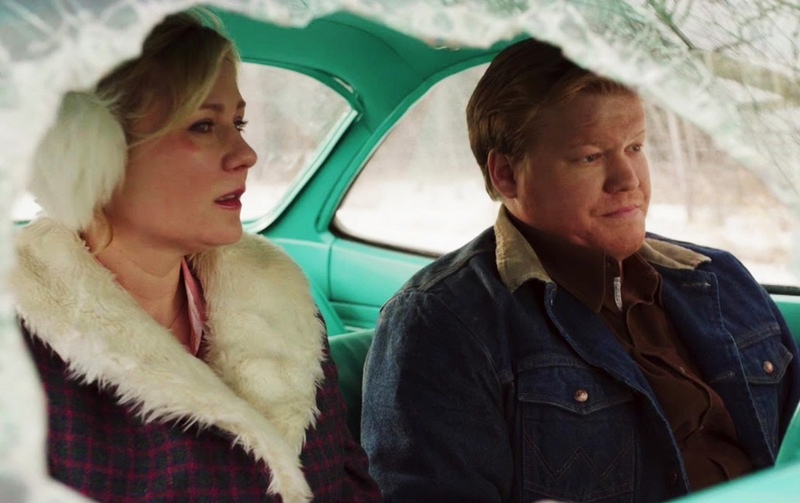 Two final themes of the first four episodes are greed and selfish ambition, themes that defined the first season of Fargo. Death often follows close behind these and, if we commit ourselves to that path, we fail to see that it is close to us. In Episode 4, Lou confronts Ed and Peggy as he begins to suspect that they might be involved in Rye’s disappearance. Ed’s never been to war, so he doesn’t understand the look that a man gets when he’s fatally wounded but doesn’t feel it yet. Lou has seen that look in dying comrades, and he sees it now in both Ed and Peggy. 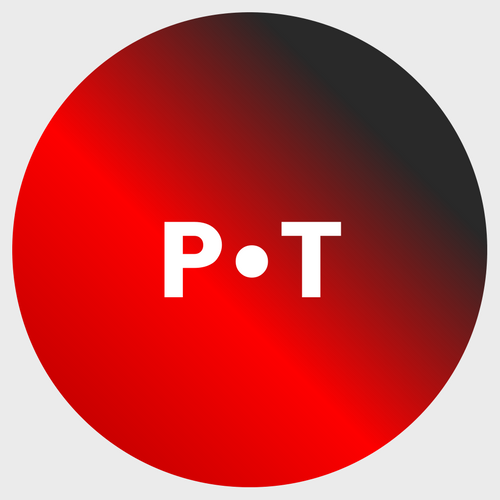 Lou tries to give them an out, a way to fix the mess in which they’ve put themselves, but, even with all of his war-time experience, Lou might still be too naive to see that such an option is itself already dead. 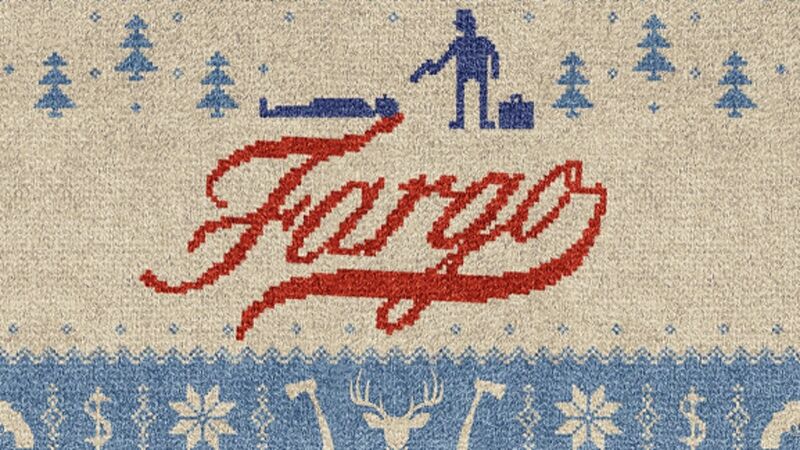 New episodes of Fargo air on Monday nights at 9 pm on FX.